Well, it is getting to that time of year when us Americans over-celebrate holidays, which often involves drinking. There are many folks who think that holiday drinking ought to entail drinking rare or expensive whiskey. Of course, rare and expensive whiskeys are fun and often delicious, but holiday drinking is about enjoying your favorite dram. So, enjoy a whiskey you might like this holiday, and avoid paying too much. With that in mind, though, here are a few tips on buying hard to find and expensive whiskeys. My primary piece of advice is probably the most important, do your research. There are whiskey blogs all over the internet, and reviews of whiskeys are not hard to find. When I am looking into buying an expensive bottle, it is usually because I have a specific flavor profile that I am looking for. To that end, I read whiskey blogs and discuss my possible purchase with friends who have had previous bottlings or expressions of the whiskey. If I am going to buy a whiskey for $80, then I want to have a good idea of what I am going to get. My second piece of advice is that just because a whiskey is old, hard to find, and expensive, does not mean that it is a great whiskey. I have said this over and over again because it is true. Every whiskey has an ideal age that depends on the type of cask used, the temperature of the storage, the nature of the new make, your palate, etc. The trick is to find the age you like a whiskey at the best, and balance that out with how much you are willing to spend on a bottle of whiskey. Without any further gab, I’ll get to my comparison review. Today, I am reviewing two 18 year-old American whiskeys, Sazerac 18 yr. and Jefferson’s 18 yr. Presidential Select. Sazerac 18 yr. is a straight rye whiskey that is bottled by Buffalo Trace in limited quantities every fall as part of the Antique Collection. 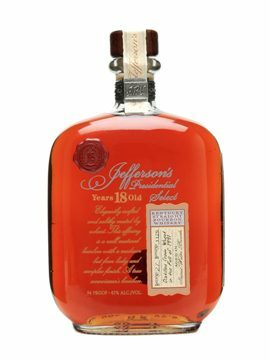 Jefferson’s 18 yr. Presidential Select is a wheated bourbon from the old Stitzel-Weller Distillery (famously the makers of the coveted Van Winkle line). Both these whiskeys are expensive, hard to find, and aged at least 18 years. 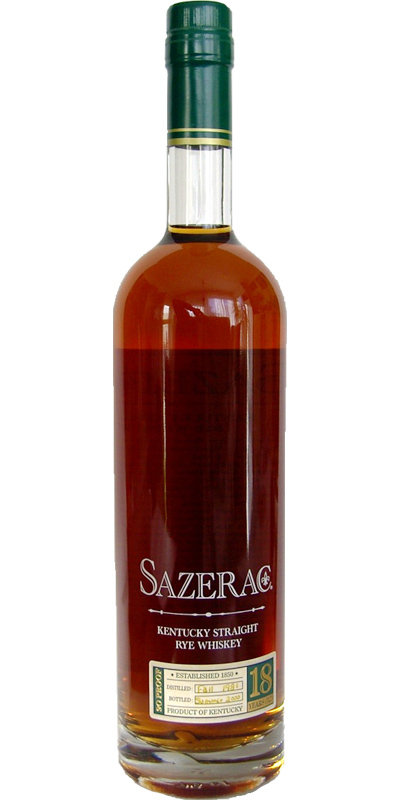 I am reviewing the Fall 2012 bottling of the Sazerac 18 yr., as it is the first and only bottling that I have tried. It is a straight rye whiskey that is also bottled and sold in a 6 yr. edition. Rye whiskeys have enough flavor to be very good at a young age, but I had always heard that the Sazerac line was at its best in the 18 year old. It is bottled at 90 proof. On the nose, the whiskey has a backbone of cinnamon and honey, but it is rounded out beautifully by oak, brown sugar, toffee, ginger, roses, and vanilla. This whiskey is alive in the glass. The scents come flooding deep into the nostrils; it is a wonderful, warming aroma. On the palate, the whiskey opens up with fresh fruits and spiced sweetness. There are notes of plums, cinnamon, oak, peaches, apples, and rye. The finish is medium long, with notes of vanilla, rye, cinnamon, and oak. My only minor complaint is that the finish can be a little tannin-ish sometimes, but that is a minor complaint. Overall, this is a brilliant rye whiskey. It balances the rye spices and the oak sweetness perfectly. It is a joy to drink, and it is a hard whiskey to beat. My grade: A. Price: $70-80/750ml. The price tag is a little steep, but it is worth a try if you can find it. This whiskey is almost an A+. Jefferson’s 18 year-old Presidential Select is a wheated bourbon from the old Stitzel-Weller Distillery. As I have documented before, I am not a big fan of wheated bourbons, but they tend to be whiskeys that age very well. Jefferson’s certainly proves that. It is a small-batch bourbon bottled at 94 proof (I am reviewing Batch 14). On the nose, Jefferson’s Presidential Select has many typical bourbon notes. The oak is clearly present, but it is dense and flavorful, not too overpowering. There are notes of toffee, corn sweetness, and melted caramel. The palate is light-medium bodied, with notes of caramel, vanilla frosting, and silky oak. It is an extremely drinkable bourbon (be careful). The finish is of medium length, but it tastes delicious, with the rich oak melding with the toffee, caramel, and vanilla. Overall, this whiskey drinks well under its proof point, and it is much better than other wheated bourbons I have reviewed on the site. However, it still falls short of greatness in my opinion. It is too light-bodied for my tastes, but that does not mean that it isn’t the rare bourbon for you. My grade: B+. Price: $90-100/750ml. This is a damn good bourbon, but it is hard to justify the money for me. It is a little too mellow for my taste. My point in all this is to say that not all 18 year old whiskeys are the same. Read up on some old whiskeys you might like to try, and let it ride! Stay tuned for Part 2 where I compare an 18 year-old Islay Scotch and an 18 year-old Speyside.